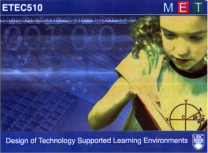 Design of technology-supported learning environments. An online seminar examining research, and exemplary media tools, as these inform the design of technology-mediated environments. We will explore constructivist and sociocultural theories of mind, learning and instruction and their significance for the design of educational technologies and environments. Students will design a technology-supported learning environment. We recommend that students complete the four required core courses as early in your program as possible.